Two World champions, a successful coach and wrestler, and the heaviest athlete in Olympic history will be inducted into the National Wrestling Hall of Fame and Museum on June 1-2, 2012 in Stillwater. Distinguished Members selected for the Class of 2012 include Fred Fozzard, Stephen Neal, Greg Strobel and Chris Taylor. Fozzard made history at the 1969 World Championships in Mar Del Plata, Argentina. He joined Rick Sanders as this country’s first World champions in freestyle wrestling. Fozzard was also a three-time All-American for Oklahoma State, winning an NCAA title in 1967. Neal won the 1999 World Championships in Ankara, Turkey. He competed for California State-Bakersfield, winning NCAA titles in 1998 and 1999. Neal went on to a successful career with the New England Patriots despite never playing football in college and was part of three Super Bowl championship teams. Strobel excelled as a wrestler, coach, and as a wrestling leader. He won NCAA titles for Oregon State in 1973 and 1974, and was the head wrestling coach at Lehigh from 1994-2008. Strobel also coached on the 1996 and 2000 Olympic teams and was in leadership positions for the NCAA and USA Wrestling. Taylor, the heaviest competitor in Olympic history, won a bronze medal at the 1972 Olympics in freestyle wrestling. He also competed in the Greco-Roman division the same year. Taylor was an NCAA champion for Iowa State in 1972 and 1973 following his junior college career at Muskegon Community College. He died in 1979. Four special award winners will also be inducted into the Hall of Fame. These recipients have contributed to the sport’s viability and success in uniquely different ways. The Medal of Courage, given to a wrestler who has overcome insurmountable challenges, is being awarded to Anthony Robles. Robles, who was born with one leg, earned three NCAA All-American honors while claiming the 2011 NCAA title at 125 pounds for Arizona State University. He is now an assistant wrestling coach for the Sun Devils. Bill Lied, Jr. will be honored posthumously with the Lifetime Achievement for Officials award. He was honored by FILA as “first category exceptional” for life. Lied was an official for many international tournaments, including the 1964 Olympic Games. Al Bevilacqua will receive the Order of Merit for his contributions to the advancement of wrestling. Bevilacqua has been coaching and promoting wrestling for 47 years as an organizer, administrator, teacher, and coach at the national and state levels. He is also one of the founders of Beat the Streets New York City wrestling program. The National Wrestling Hall of Fame will honor two recipients with the Outstanding American Award in 2012. This year’s winners are Chris Bevilacqua and Andrew Barth. Chris Bevilacqua, a two-time All-American for Penn State, is the founder and CEO of Bevilacqua Media Company, whose mission is to be a principal investor and strategic advisor for media and entertainment assets. Prior to forming BMC, Bevilacqua was the CEO of Creative Artist Agency (CAA) Sports Media Ventures, Co-Founder of CSTV which was sold to CBS Sports in 2005 and Global Director of Negotiations for Nike Inc., from 1994-1999. Chris is also the son of Al, which makes these honorees the first father and son to be inducted into the National Wrestling Hall of Fame in the same year. Barth was a member of the varsity wrestling team at Columbia University from 1979-1983 and co-captain of the team his senior year. He represented the New York Athletic Club in Greco-Roman and freestyle events from 1980-1985. Upon graduation from the Columbia Business School in 1985, Barth moved to Los Angelis to begin working for The Capital Group, a global financial investment firm as a financial analyst. Today, Barth is Chairman of the Capital Guardian Trust Company. In September 2005, Barth made a gift to fully endow the head wrestling coaches’ position at Columbia, creating the Andrew F. Barth Head Coach of Wrestling position. If you would like to attend the inductions please contact the Hall of Fame to receive an invitation to be mailed by March 2012. For more information on Honors Weekend contact Krista Graff at (405) 377-5243 or kgraff@nwhof.org. 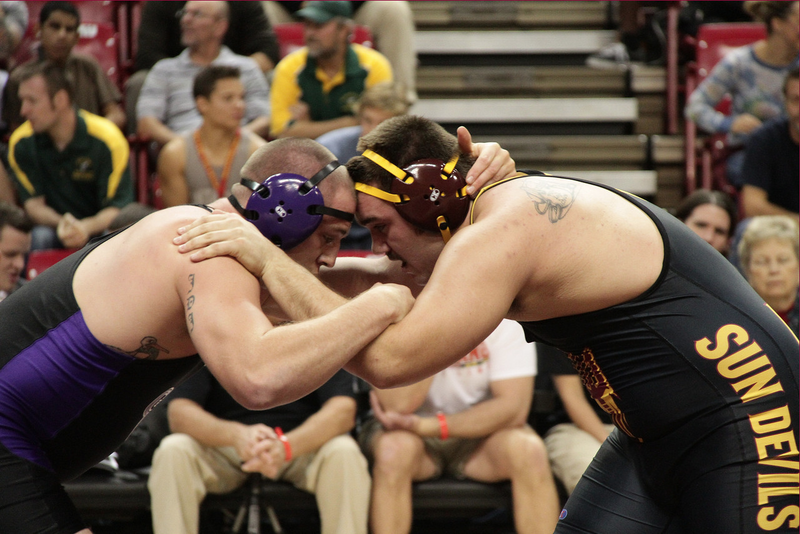 Twenty of the top collegiate wrestlers from across the U.S. participated in the event. In the only exhibition match of the night, Cooper used a takedown in the third period to collect a 3-2 decision over Johnson, a transfer from the University of Iowa and two-time place winner at the Asics University National Championships. Smith, who took the mat in place of Tyler Nauman of Pittsburgh in the 149-pound bout, fell behind early to Oklahoma State's Jamal Parks, but countered with a pair of reversals and escapes to help cut the margin. Parks, however, tacked on a pair of takedowns and two bonus points for riding time in the third period to win the match. Jordan Oliver and Parks helped Oklahoma State pick up a pair of victories, while Edinboro's Chris Honeycutt registered the only pin of the night. Maryland, American and Wyoming, who all also had two wrestlers in the classic, each registered a win and a loss. Nic Bedelyon of Kent State won 7-3 over Oklahoma's Jarrod Patterson in the 125-pound bout. It was scoreless after the first period and knotted at three apiece heading into the third before Bedelyon recorded a near fall and a bonus for riding time to get the win. In the closest match of the night, Oliver won an 8-7 decision over Illinois' B.J. Futrell in the 133-pound bout. Oliver led 3-0 after a takedown in the first period and an escape in the second, but Futrell collected three takedowns in the third period to tie it up. However, a late escape by Oliver gave him the win. After the 141-pound match was scoreless through the first period, Cal Poly's Boris Novachkov gained three points in the second period and added one at the buzzer to get a 4-0 decision over Zack Kemmerer of Penn. American's Ganbayar Sanjaa got the early takedown, but Jason Welch of Northwestern countered with a pair of his own takedowns and an escape to win the 157-pound match, 8-5. It was a rematch of last year's all-star classic at 165 pounds, but the result was different. Maryland's Josh Asper took a 6-4 decision over Wyoming's Shane Onufer, who won at last year's event. Asper had a 2-1 lead after the first period and stretched the margin to 5-1 after two periods. Onufer battled back in the final period and brought the deficit to two, but Asper was able to hold on for the win. The 174-pound match was scratched due to injury. In the 184-pound matchup, Ben Bennett of Central Michigan got an early takedown in the first period, but Wyoming's Joe LeBlanc, trailing 3-1, used a reversal and a late takedown of his own in the third to win the match, 5-4. Honeycutt pinned two-time defending national champion Byron Tate of Div. III Wartburg a mere 32 seconds into the first period to record the victory in the 197-pound match. Ryan Flores of American jumped out to a 5-1 lead after the first period and never relinquished his lead, using a late takedown and a bonus for riding time to win an 11-2 decision over Maryland's Spencer Myers in the 285-pound division.